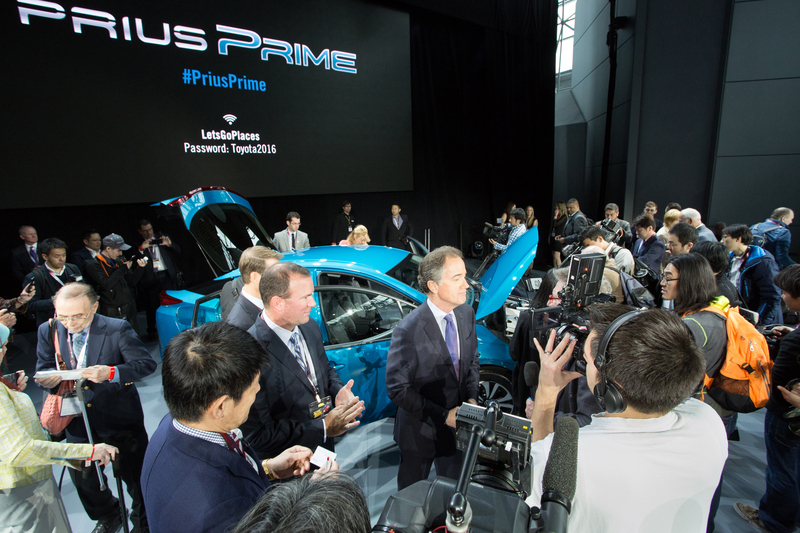 The 2017 plug-in hybrid Prius Prime unveiled last week will not only use ultra-high-strength steel, but feature an aluminum hood and a carbon fiber rear hatch, Toyota announced. “In fact, the lightweight carbon fiber rear hatch makes opening and closing almost effortless,” Toyota wrote in a Wednesday news release accompanying the car’s reveal at the New York International Auto Show. The regular Toyota Prius has an aluminum hood, as did the last generation of the car, a Toyota spokesman confirmed. The 2017 Prime will be the only Prius with a carbon-fiber hatch. This Prime lightweighting helps it act completely like an electric car for 22 miles — double the old Toyota plug-in Prius. The car also uses ultra-high-strength steel and features the same Toyota New Global Architecture platform like the regular 2017 Prius. Find out more about that version here. “As parsimonious with fuel as the Prius Prime may be, it drives with the same verve as the standard new-generation Prius hybrid, one result of the new high-strength platform and double-wishbone independent rear suspension,” Toyota wrote in the release. The last tally we could find for Toyota’s previous plug-in try was $29,990. 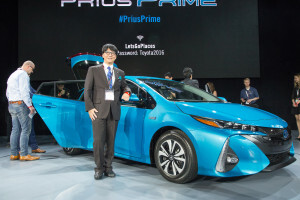 Automotive News reported Toyota would narrow the $5,000 difference between older Priuses and plug-ins. Automotive News also analyzed potential pitfalls for Toyota: The old plug-in only sold a little more than 42,000 vehicles over its entire life, other new plug-ins have more range, and a TrueCar analyst observed that there hasn’t been much demand for plug-ins. The newspaper also noted the lack of a fifth rear seat. Relying on past demand to predict future performance could be short-sighted given the new range plug-in hybrids are posting. Thus, we feel collision repairers should understand a little about the vehicles and how they work even if the powertrain is more the domain of mechanical repairers. Plug-in hybrids are hot right now — we heard a lot of discussion of them at Megatrends USA last week — and Chrysler even announced it would sell a plug-in hybrid minivan. They get about 20-odd miles on just battery alone and can charge in a few hours on even a home outlet. The Prius Prime gets 22 miles, can go up to 84 mph, and charges in 5.5 hours with a standard outlet, according to Toyota, which calculated that 22 miles is the average commute half of Americans drive. Get a utility to install a 240-volt outlet and it’ll charge in 2.75 hours, according to the OEM. They could therefore be appealing because of how people use their cars: You run an errand or drop the kids off at school, then come back and plug in the car. If the trip is short enough, you’ve used zero gas. Rinse and repeat. But if you’re out of juice, you’ve still got gas to fall back upon. Toyota estimates that a topped-off and fully charged Prime could get 120 mpg and travel 600 miles before dropping spent. Think about this potentially huge gas savings and how full-electric vehicles struggle to compete with gas or hybrid cars on price and range, and you can see why the idea would seem attractive to OEMs — not to mention car buyers.